March is Women’s History Month, and every year, the National Women’s History Project develops a theme for the event. Race car driver, commentator, author, motivational speaker. Competed in seven Indianapolis 500 races in nine years, including six consecutive years. Two-time competitor in the 24 Hours of Le Mans, the world’s oldest endurance sports car race. Nine-time participant in the 12 Hours of Sebring race. Two wins at the 24 Hours of Daytona race. Owner of over 30 national and international speed records over a 20-year period. A courageous, determined, hardworking, record-breaking, and inspirational race car driver. A woman. Throughout her career, Lyn helped other female athletes build successful careers just like she had. 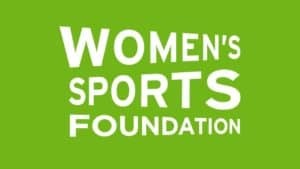 She serviced as the President of the Women’s Sports Foundation for 3 years, and established her own charitable foundation, Women in the Winner’s Circle, in 1994. Her work with the foundation even led to the formation of a traveling museum exhibit about female drivers, created with The Henry Ford, in 2010. In 2011, Lyn St. James donated a collection of personal papers and memorabilia to the museum. Looking through the materials St. James chose to archive throughout her career, her passion for the advancement of women in sports in abundantly clear: a letter written to legendary athlete Billie Jean King, newspaper clippings about female race car drivers from around the country, notes of support for the America3 Women’s America’s Cup team. All of these underline her commitment to the cause. Looking through the memorabilia in the collection, we are filled with such esteem for the work she has undertaken to help women achieve everything they can in sports, and in life. One artifact in particular spoke to us. At first glance, perhaps this checkered flag from the St. James collection in the Benson Ford Research Center doesn’t seem like anything extremely special. However, take a second look. Notice that each white square of the flag is signed by a different race car driver, and all of them were women. 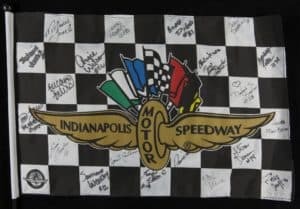 The signatures of Janet Guthrie (the first woman to race in the Indianapolis 500 in 1977), Erica Enders, and Erin Crocker can all be seen on the flag. These women, and all of the others who took a permanent marker and signed their name, have found success in racing and have proven their worth on the track and off. Women continue to make strides in the world of auto racing. Take a look at Sarah Fisher, Danica Patrick, and Courtney Force Hood, just to name a few. Sarah has driven in the Indianapolis 500 9 times now, Danica is the only woman to earn a victory in an IndyCar Series event (the Indy Japan 300 in 2008), and Courtney currently holds the record for most wins by a female driver in NHRA history. Gender equality in sports means much more than just the opportunity for women to compete alongside men. It means that women are able to live in a society that believes in and encourages their dreams, and allows women to have the skills, confidence, and community support to take the lead in their field. Lyn St. James’ racing career began in deep water and is ending at the top of the hill. A pioneer in auto racing with an accomplished career across a wide spectrum, St. James will be inducted into the Sports Car Club of America Hall of Fame in a ceremony Jan. 21 in Las Vegas. Such an occasion would have been the very last thing on St. James’ mind in 1974 when she made her rather ignominious — and quite soggy — auto racing debut. The race was an SCCA Showroom Stock event at Palm Beach International Raceway in West Palm Beach, Fla. An SCCA driving school graduate, St. James had purchased a new Ford Pinto – cost $2,500 – from the showroom floor. She drove it to the track for her first try at competition. She was slow. Quite slow. The race leaders roared up behind St. James on the way to lapping her. Surprised, she lost control of the Pinto, and it spun off the track and into a lake between Turns 2 and 3. The car went underwater. St. James, though somewhat embarrassed, escaped without injury, and the car was pulled from the muck to race again. “I lost control of the car because I wasn’t watching my mirrors,” St. James said. “It went into the body of water. We thought it was a pond, but turned out it was bigger than that. The Pinto, cleaned up and dried out, returned to race again and again, and St. James won the Florida SCCA regional championship the next year. She had no idea then, of course, but the adventure with the Pinto would be only the first chapter in her eventful relationship with Ford Motor Company and Ford Performance. Ultimately, the Ohio native would race on some of the world’s top courses — Indianapolis Motor Speedway, Daytona International Speedway, Le Mans and the Nurburgring — and build a reputation as one of the best female drivers in racing history. Her official relationship with Ford began in 1981, although, as St. James will admit, her “contacts” with Ford officials began much earlier. She had established herself as an excellent amateur road racer in SCCA events, but her goal was to compete professionally. That wasn’t possible without a path that would lead to sponsorship and support. The door began to open — ever so slightly — in 1978 when St. James read a magazine article about Ford’s push to provide equal employment opportunities for women. The article quoted Ford officials, and St. James started a letter-writing campaign to introduce herself. Ford signed St. James and immediately boosted her career. “I will say to anybody and everybody who will listen that without that happening I don’t believe I would have had a career,” she said. “I would have continued racing, but it would have been really sketchy. God only knows how long I would have been able to sustain that. St. James would move from the IMSA Kelly American Challenge Series into IMSA GT, where she scored six wins. She also ran SCCA Trans-Am. She scored two class wins in the 24 Hours of Daytona, teaming up with greats like Bill Elliott, Tom Gloy and Scott Pruett to win in 1987 and then she teamed with Robby Gordon and Calvin Fish in a Roush Racing Mercury Cougar to win the GTO class in the 24 Hours of Daytona and 12 Hours of Sebring (1990). Her greatest IMSA win may have been in 1985, when she became the first and only woman to win an IMSA race driving solo, taking the checkered flag in the September race at Watkins Glen. She also raced Ford-powered cars in the 24 Hours of Le Mans in 1989 and 1991. In 1988, St. James participated in speed runs at the giant Talladega Superspeedway in Alabama, driving a Ford Thunderbird to a then women’s closed-course speed record of 212.577 miles per hour on the 2.66-mile track. Racing at Indianapolis Motor Speedway wasn’t a goal – or even a random thought — for St. James for much of her life, but doors opened and she walked through. “I can get big dreams, but that wasn’t even a dream at all,” she said. “That was far out there past my abilities and resources. But the more I ran – the Trans-Am Series was often a support race for Indy cars. So I was around them a lot. They’re not so ominous when you’re actually at the track. They were fast and they were cool, but, in a way, they’re just another race car. “I got this idea in my head that I wanted to drive an Indycar. I didn’t think I’d ever race one, but I didn’t want my driving career to end without at least sitting in one. St. James finally put together a sponsorship deal with department store chain JCPenney to run the 1992 Indy 500. “It was the 151st company I had gone to looking for sponsorship,” she said. At 45 years old, St. James surprised many in the Indycar crowd by finishing 11th in her first Indy 500 and winning the Rookie of the Race award. St. James raced partial IndyCar schedules through the rest of the 1990s. Along the way, she became very active in women’s sports groups, serving as president of the Women’s Sports Foundation and starting a foundation and scholarship program of her own. And what about that original Pinto, the Ford that started it all? 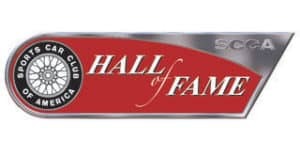 TOPEKA, Kan. (Dec. 5, 2016) – Eight individuals who have made significant contributions to the Sports Car Club of America and the world of motorsports have been announced as the Club’s newest Hall of Fame class, adding their names to a list of timeless superstars. Pete Brock, Dennis Dean, Larry and Linda Dent, Joe Huffaker Sr., Lyn St. James, Phil Hill and Jim Kaser comprise the latest class to join the select ranks. As in years past, this group will be formally inducted to the Hall of Fame as part of the SCCA Hall of Fame and Awards Banquet. That event takes place Saturday, January 21 and serves as the capstone of the three-day SCCA National Convention taking place again in 2017 at the South Point Hotel and Casino in Las Vegas, Nevada. Along with the accomplishments of the 67 previous inductees, these Hall of Fame members positioned the building blocks that have elevated SCCA’s stature in the motorsports world for more than 70 years. At only 19 years old, Pete Brock was the youngest designer ever hired by General Motors. In November 1957, at only 21 years old, he drew the sketch which GM VP Bill Mitchell picked to become the Stingray. A native of the San Francisco Bay area, Brock also began racing with SCCA around that time. Brock went on to work with Carroll Shelby. During his time with Shelby, he helped create the Shelby American brand logos, merchandise, ads, car liveries and more. He also designed the Shelby components of the Shelby Mustang GT350, as well as the iconic Shelby Daytona Cobra coupes that won the 1965 FIA World GT Championship. In 1965, Brock started Brock Racing Enterprises which later became Datsun’s West Coast factory race team competing in SCCA D Production races with Datsun 2000 roadsters. In 1970 and 1971, BRE took on C Production with 240Zs and earned national championships. He followed that up in 1971 and 1972 with 2.5 Trans Am national championships in Datsun 510s. Dennis Dean began his involvement with SCCA as a tech inspector due to his interest in all things mechanical. Because of his insight as a tech inspector and his Navy training, his documentation with respect to tear down checklists and other procedures have kept many stewards out of trouble over the years. At the Regional level, Dean provided Washington DC Region a wonderful set of standards that are still being used today. He later joined the SCCA stewards program where his unparalleled technical excellence served him and the Club well. But beyond that, Dean exemplified all the personal attributes that have been stressed to SCCA stewards. After many years as an outstanding SCCA volunteer, he took on a new challenge in 1996 when he joined the SCCA staff as Vice President of Club Racing and Rally/Solo. And after his stint with the national office, Dean found time to further expand his impact with ever increasing involvement in the Runoffs, providing guidance and leadership to the Hall of Fame project, and serving on the SCCA Foundation Board. In each of these areas his impact has been felt both now and into the future. SCCA members Larry and Linda Dent designed the SCCA Safety Steward program, a vital initiative that has improved motorsports safety as a whole. Since 1967, Larry has been an SCCA Chief Steward. He also served the SCCA for nine years as a member of the Board of Directors. He was a member of the Executive Committee, serving as liaison to the Competition Board. He also helped as Chairman of the Board of the SCCA Foundation, serving three years in that capacity during which time he significantly improved the Foundation’s financial standing. And while Larry is the one that held the “official” titles, make no mistake that he and Linda worked as a team over the years to advance the Club. In 2008, Larry received the Woolf Barnardo award, the top award for service to the Sports Car Club of America. For more than 30 years, Joe Huffaker Sr. was one of the most successful racecar constructors. In 1954, he was contracted to build an Austin-Healey Special. The car, known as the Huffaker-Healey, was a common site in the late 1950s on race tracks in Northern California. In 1959, Huffaker joined British Motor Cars in San Francisco to open a competition department. Known as BMC Competition Department, this effort spawned a very successful string of cars including the BMC Formula Juniors and Genie Sports Racers. During this era, BMC Competition Department became one of the largest racecar manufacturers in the United States. From 1964 to 1966, Huffaker’s attention was turned toward Indianapolis 500 competition. He helped build the famous MG Liquid Suspension Specials, for which he received an engineering award for design and development. Huffaker also helped develop safety technology in the form of the deformable fuel cell. Not forsaking SCCA racing, BMC Competition continued to build dominate production racecars such as MGBs and Jaguar XKEs. But in 1967, Huffaker left BMC and formed Huffaker Engineering where preparation of winning cars continued. These included SCCA championship winning MG Midgets, MGBs, Triumphs and Jensen-Healeys. In the 1980s, Huffaker Engineering built Pontiac cars for the Trans Am and IMSA series. Lyn St. James started in Florida as a racer in Showroom Stock classes, and was the 1976 and 1977 Florida regional champion. A two-time class winner at Daytona, a class winner at Sebring, and a class winner at the 24 Hours of Nürburgring, she has also competed at Le Mans and was a 1988 record speed holder of 212.577 at Talladega in a Ford Thunderbird. James entered 53 SCCA Trans Am races and was a top-five finisher seven times. She also entered 62 IMSA GT races, and was a top-five finisher 17 times. She is the only woman to win an IMSA GT race driving solo, when she won in 1988 at Watkins Glen. The Indy 500 Rookie of the Year in 1992, James went on to form the Women in the Winner’s Circle organization dedicated to the advancement and promotion of women in the motorsports industry. Outside of racing, she was also the President of the Women’s Sports Foundation during the early 1990s. 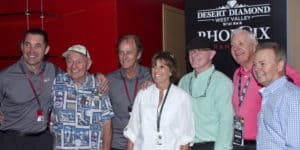 The only American-born racer to ever win the World Drivers’ Championship, Phil Hill was one of the first dozen members of the California Sports Car Club. He began his storied career wrenching on others’ cars and went on to compete in major SCCA races. He piloted assorted Alfa Romeos, OSCA’s and various Ferrari’s for wealthy car owners, and quickly gained a reputation as the man to beat in West Coast racing. In 1955, Hill was the SCCA Champion in D Modified, driving a Ferrari to wins in 8 of 14 races, including the inaugural event at Road America. He began racing outside the U.S. that same year which later landed him a drive with Ferrari in Formula One. But beyond Formula One, Hill exhibited a great deal of prowess as an endurance driver. He was an overall winner at Le Mans and Sebring three times, and became Sports Illustrated’s 1959 Sports Car Driver of the Year. The original head of SCCA Pro Racing, James E. “Jim” Kaser oversaw the first SCCA professional racing series, the United States Road Racing Championship (USRRC). The success of USRRC led Kaser to organize a series initially involving two Canadian races, thus giving birth in 1966 to the Canadian American Challenge Cup, more commonly known as the Can-Am series. Soon after, Kaser’s Pro Racing department introduced America’s longest running road racing series, the Trans-American Sedan Championship, later known as Trans Am. It was Kaser’s success with these series that resulted in the most significant change ever to the Sports Car Club of America. The organization turned from being an amateur’s club to a professional, international sanctioning body and organizer. The history of motorsports usually revolves around men who became heroes behind the wheel. But this year’s Arizona Concours d’Elegance features a panel discussion that looks into the exciting lives of women who have raced professionally. Legends: Pioneer Women in Racing is one of three panel discussions that take place Saturday, January 14, 2017. The panel will include veteran race driver Janet Guthrie, the first woman to compete in both the Indianapolis 500 and the Daytona 500 in the 1970s, and Miranda Seymour, an acclaimed author whose book, Bugatti Queen, explores the life of Hellé Nice, the famed French woman racing driver who competed in the 1920s and ’30s. The discussion will be moderated by another female racing star, Lyn St. James, also of Indianapolis 500 fame. 1967 Ferrari NART Spyder & 1960 OSCA Formula Junior (from the Collection of Lawrence Auriana) driven by Denise McCluggage – Automotive journalist and race car driver, she is the first automotive journalist inducted into the Automotive Hall of Fame. 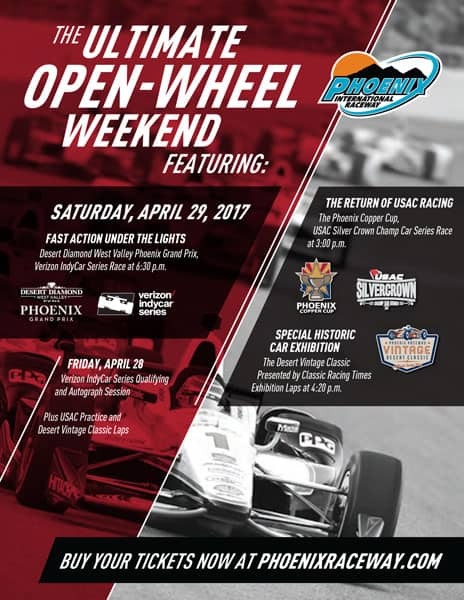 For more information, visit www.ArizonaConcours.com. Tickets to attend all panels are priced at $60 and available through www.ArizonaConcours.com/ticket The Arizona Concours d’Elegance is a not-for-profit corporation registered with the State of Arizona, with federal 501(c)(3) status. Lyn St. James is a Badass! 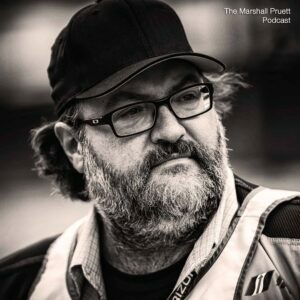 Motor racing reporter Marshall Pruett interviews today’s stars and yesterday’s heroes in his new podcast series: The Marshall Pruett Podcast. She raced and won in IMSA, scored a popular GTO class victory at the 24 Hours of Daytona, competed at the Indy 500 and 24 Hours of Le Mans, called Bruce Jenner a teammate, overcame significant prejudice while developing her career, crawled through burning wreckage after flying hundreds of feet in a terrifying GTP crash, and broke new ground for women in boardrooms and sponsorship opportunities. St. James, who followed in the wheel tracks of Indy pioneer Janet Guthrie, was the prototype for Danica Patrick, Sarah Fisher, Simona de Silvestro, and every other woman who has found success and prosperity in motor racing since her rise to stardom. 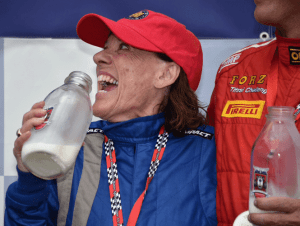 A badass in every sense, Lyn St. James shares her incredible life and story as a racecar driver with the Marshall Pruett Podcast. To listen – please click the play button below or visit Marshall’s website. The North Carolina Motorsports Association will host its Annual NCMA Membership Luncheon presented by IDG Racing on Tuesday, November 15, 2016 at The Speedway Club Ballroom (Charlotte Motor Speedway). This year’s luncheon will feature an outstanding “Women in Motorsports” panel discussion featuring some of the most prominent women in world of motorsports. Among them: NASCAR’s Jill Gregory, JR Motorsports’ co-owner Kelley Earnhardt Miller, GM Performance’s Alba Colon and racing legend Lyn St. James. The panel will be moderated by Erin Evernham. The luncheon is scheduled from 11 AM – 1:30 PM. Members of the NCMA receive one complimentary ticket, additional tickets can be purchased for $30. Non-members can purchase tickets for $50. For additional information, please visit the NCMA website. To register, please click here. Four dynamic industry leaders – including Lyn St. James – will take the stage for a special panel discussion on opportunities for women in racing at this year’s PRI Trade Show. The all-female panel – scheduled for 8AM – 9AM on Friday, December 9 (Indiana Convention Center, Room 242) – will cover a host of topics related to opportunities for women in racing. 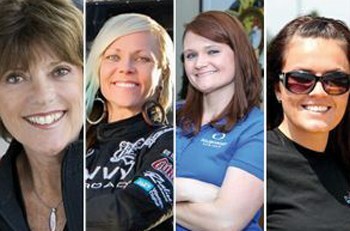 The panel includes former IndyCar driver and 1992 Indy 500 Rookie of the Year Lyn St. James; professional driver, fabricator and TV personality Jessi Combs; Roush Yates Engines Quality Manager Jennifer LaFever; and Jeanette DesJardins, owner and founder of Car Chix and Crank It Media. In addition to sharing their own personal stories and experiences in motorsports, panelists will address subjects like career paths, business relationships, sponsor attraction, and more—all geared toward advancing female participation in the trade. The program will be interactive as well, with audience members encouraged to ask questions and solicit advice from these highly accomplished professionals. PRI’s “Women in Motorsports” seminar, which is hosted by PRI Magazine Editor Dan Schechner, is offered free of charge to registered Trade Show attendees and exhibitors. For additional information and details, please visit PRI’s website. On Wednesday, November 9, Lyn St. James is set to be the keynote speaker at the 2016 San Antonio Auto & Truck Show kick off breakfast. The San Antonio Automobile Dealers Association presents the 48th annual show – which this year runs from November 10-13 at the Henry B. Gonzalez Convention Center in San Antonio, Texas. Space is limited. To purchase tickets, please visit the San Antonio Auto & Truck Show website. Or for additional details and information, please also visit their Facebook page.